Banishing compromise from its outlook on printing, the Epson RX585 nails its vibrant colours firmly to the mast of photographic output, with a purely dye-based range of six Epson Claria inks. This means that document printing is definitely second-best, with greyish, faded-looking mono text. More surprisingly, photocopying speeds for colour graphics documents proved particularly slow. Getting back to the RX585's strong point, colour rendition for photo output is especially vibrant, bright and punchy. In fact, the Epson tended to boost contrast in many of our test photos, to a point where areas of very light highlights in images were washed out to white, losing definition in the process. 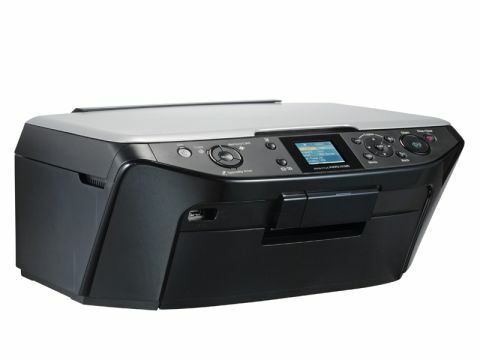 The printer also proved a little harsh for skin tones, giving less pleasing results than the Canon MP620. Standalone controls are straightforward, making for simple photocopying and photo printing from memory cards. The sharpness, contrast and colour rendition produced by the scanner are impressive but, again, not quite a match for some of its peers. Speed, or the lack of it, is also a bit of an issue, with the Epson taking about three times as long to output A4 photos in top quality mode. However, dropping from "Best" to normal-quality photo mode has remarkably little impact on quality, while effectively doubling the print speed. As a photo-specific all-in-one printer, the RX585 has a good range of features and will delight photographers who prefer high-impact, vibrant colour to the often slightly more muted tones of real life. However, compared with the best of the competition, it's ultimately lacking in versatility.